The image we show here above is the only impression we have of the original public house. It was of course taken from a painting and we cannot determine how accurate it is. We do not know when the Wheatsheaf Inn in Chapel Street Thornbury began trading as a public house. One clue to how long it had traded is in the court case of 1884 cited below in which the solicitor says that the pub has traded for 53 years without a problem. This implies that it was a public house from about 1831. It may not have traded by that name from the beginning and we can only say that we have many trade directories. Of these a directory of 1830 mentions the principal inns but not the Wheatsheaf and that of 1839 mentions John Williams only as a beer retailer. In his will dated 5th day of November 1844 John Williams described himself as “Beer House keeper at the sign of the Wheatsheaf.” This is our earliest reference so far to the pub being known by that name. The Bristol Times and Mirror of 14th October 1854 reported the death on October 9th of Hannah the widow of John Williams “late of the Wheatsheaf Inn Thornbury.” It is interesting that the Wheatsheaf was described as an inn rather than a beerhouse. In the 1868 trade directory for example there is no mention of the Wheatsheaf Inn among the inns and public houses. This may have been a reflection of the status of the establishment. It certainly seems to have been generally considered to be a “beerhouse” rather than as an “inn”. We have a newspaper report of November 22nd 1869 before the magistrates W O Maclaine Esq and Major Charlewood which both describes it as a beerhouse and gives the impression that it might have been a lively establishment. 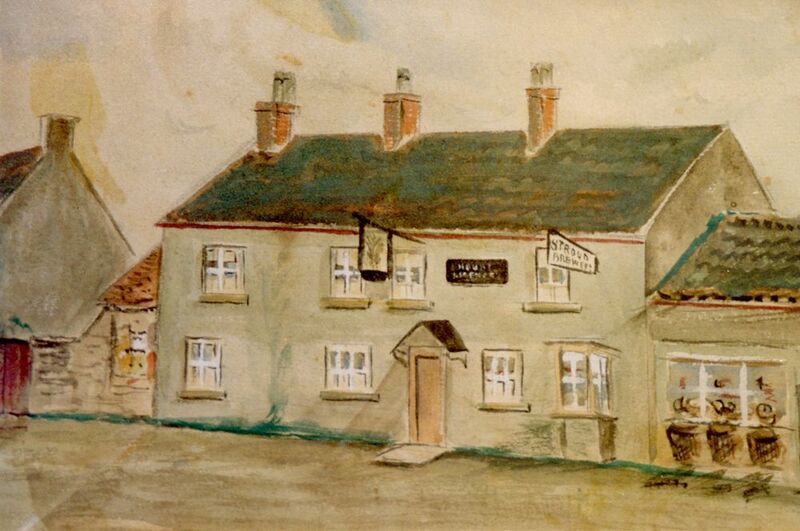 The Wheatsheaf Inn was built on land that was once part of The Paddock in Thornbury. The land was owned by the Mansell family, John and Mary Rudge, William Taylor and Mathew Mills. Read more …. We have seen the records of other properties on this land because they are held by South Gloucestershire Council which bought many of the houses for the redevelopment that took place in Thornbury in the 1960s. The Wheatsheaf was not affected by this redevelopment and we have not seen the deeds for the property. We do know that John Williams acted as trustee of the will of Mathew Mills who still owned some of the land and properties on it at the time of his death. He is mentioned in this capacity in a transaction dated 1833. We do not know when John Williams acquired the Wheatsheaf or when it was built but it appears to have been before Mathew Mills died and must have been by 1831 when (as already explained) we know it was operating as a beerhouse. John and Hannah Williams. We believe that John Williams married Hannah Williams on 17th January 1813 at St James in Bristol. It appears from later census records that John was born in Alveston around 1784. Hannah was born about 1782 in Olveston, the daughter of James Williams and his wife, Sarah (nee Bates). John and Hannah appear to have settled to live in the Thornbury area immediately after the wedding. Their son, James, was baptised there on 27th June 1813. John was described as a farmer at this time. John was described as a labourer on 31st January 1815 when their daughter, Maria, was baptised and on 8th June 1817 when Caroline was baptised. By 12th December 1819 when their daughter Hannah was baptised and on 17th June 1821 when Susan was baptised, John was described as a shopkeeper living in the Borough of Thornbury. The baptism record of their son, John, on 4th July 1824 describes John as a husbandman living in the Borough. We do not know when or how John Williams acquired The Wheatsheaf and the associated land but we assume it was by 1831. The Tithe Apportionment that was drawn up between 1838 and 1840 shows that John Williams already owned plot 108 that is now the Wheatsheaf with a garden and plot 109a coal yard behind it, which was tenanted by John Carwardine. We do not know what happened to the coal yard. At this stage can only assume that it was the business advertised as coal merchant and sanitary ware depot in Chapel Street as late as 1904 and that is was eventually absorbed into the property occupied by The Wheatsheaf when it was rebuilt in 1911. The 1841 census shows that John and “Anna” Williams were both about 55 years of age. John was described as a beer retailer and they appear to be living at what is now the Wheatsheaf Inn. The children were Caroline and Mary aged about 20 and John aged about 15 who was a tailor’s apprentice. Of the four lodgers they had living with them three were tailors; Richard James, Frederick Jones and William Brown. Abel Burchell was a sawyer. John and Hannah both died in 1854; John on 27th August and Hannah on October 9th. John’s will left the Wheatsheaf to his wife Hannah for her life time. His goods, chattels and effects (except the eight day clock that was to go to John) were to be divided equally amongst his three daughters and his son James. The Wheatsheaf itself was to go to his son John, after Hannah’s death. The two sons of John and Hannah Williams became shopkeepers and tradesmen in Thornbury. The younger son, John and his wife Emma Williams (nee Hodges) especially owned a great deal of property in Thornbury. Please follow the links below to read more about this influential family. Maria Williams was baptised 8th January 1815. She died aged 20 and was buried on 26th July 1835. Hannah Williams was baptised on December 12th 1819. Hannah married a saddler called Robert Charles Maisey (or Maysey) on 6th May 1844. It seems likely that in the census of 1841 Robert was living with his brother Charles who was a saddler in Painswick, Gloucestershire. Certainly Robert and Hannah were living in Greenhouse in the parish of Painswick when their daughter Mary was baptised in 1845. We understand from family trees on the Ancestry website that they had seven children. It seems that they eventually emigrated to Australia. Robert became a farmer at Bayenong East, Ballarat where he died in 1878. Hannah died at Ballarat in 1902 aged 83. Susannah (or Susan) baptised 17th June 1821 was referred to in her father’s will as Susannah Williams, confirming that she had not married by that time. FG Playne and Sons as executors of Forwood Brewery Minchinhampton. Alfred Stinchcombe must have been the last of John Williams tenants in the Wheatsheaf and he became bankrupt by 1892. The business was run by brewery companies after this date. The rate books of 1891 and 1892 show FG Playne and Sons for Forwood Brewery Minchinhampton as the owners of the premises. This company became part of the Stroud Brewery Company and the rate books in Thornbury from about 1899 reflect this change of name. We have Rate Books up to 1926 and these continued to show Stroud Brewery as the owner. Stroud Brewery merged in 1958 and became West Country Breweries and these in turn were taken over by Whitbread. It is noticeable that many of the publicans had occupations other than running a public house. We believe that this is often because, although the man held the licence, it was generally the wife who ran the pub, at least during the day. John and Jane Liddiatt. The 1861 census shows John Liddiatt a sawyer aged 56 and Jane aged 40 lived in the Wheatsheaf with a niece, Hannah Ridwell aged 16, a lodger David Tanner aged 62 who was a road labourer and Henry White aged 30 who was an agricultural labourer. In 1851 John Liddiatt was living in Horseshoe Lane and he was a master sawyer aged 49. His wife was called Mary and she was born in Almondsbury, she was aged 46. We suspect that John was the son of William Liddiatt who was also a master sawyer. Mary died in 1851 shortly after the census. John married his second wife Jane Heard on 8th April 1854 in St Andrews Church in Clifton Bristol. the record of their marriage shows that John’s father was called William and Jane’s father was called John. The 1861 census shows John Liddiatt now living with Jane, his new wife, in Rotten Row (now Chapel Street) in the Wheatsheaf. Jane was aged 40 and born in Hartland in Devon. The 1851 census shows Jane as a servant in Chudleigh House in Clifton, Bristol in the household of an attorney called Henry Britton. We do not know when John and Jane became publicans at the Wheatsheaf Inn. However, for the reason explained below, we can be sure that they were living in the Wheatsheaf in 1855 and we assume that they took over straight after the death of John Williams senior. We can say with confidence that they were in the Wheatsheaf in 1855 because on August 11th of that year the Bristol Mercury reported that John Liddiatt gave evidence in a case against Mr and Mrs Daniel Allen of Shepperdine. They had been selling cider and spirits without a licence. Two witnesses in the case, Mr Light and Mr Lock, had been at the Wheatsheaf when they discussed the fact that they had been served with alcohol by Mrs Allen. John Liddiatt was called to give evidence that the two men had been in the Wheatsheaf and had talked of having rum and cider at Mrs Allen’s. John Liddiatt must have died by 1869 (probably as early as the June quarter of 1861) as Jane Liddiatt re-married in Bristol in December quarter of 1869, to a widower, John Drake. Alfred Ponting. The 1871 census mentioned the Wheatsheaf Inn by name. It shows the innkeeper as Alfred Ponting aged 26 and from Compton Dando in Somerset. His wife Susan Sophia was aged 27 and from Colerne in Wiltshire. They had an 11 year old niece living with them. This was an interesting time in Thornbury and just before the railway was to be opened after a long and difficult struggle. This is probably reflected in the number of labourers who were lodging there – eleven in all from different parts of the country. The Wheatsheaf Inn was in a very convenient place and less than five minutes walk from either the end of the railway embankment or the station platform. The birth of a Susan Sophia Poynting (sic) was registered in Chippenham in 1844. She was the daughter of Thomas Pointing a butcher and his wife Sarah. In the 1861 census they were living in Wickwar near Thornbury and Susan was 17 years old. The IGI shows that Susan Sophia Pointing aged 27 and daughter of Thomas Pointing married Alfred James Pointing the son of John Bence Pointing aged 26 in the March quarter of 1871 in St Phillip’s and St Jacob’s in Bristol. Sadly the Bristol Times and Mirror of 19th August 1876 reported the death at the Wheatsheaf Inn on July 22nd of that year of Susan Sophia aged 32 the wife of Mr Alfred Ponting. The 1901 census shows that Alfred was still a widower and was working as a market gardener in Corston in Somerset. The 1911 census shows that he was a miller aged 68 and working in the same area. He had married Mary Lavinia Eatwell eight years earlier in the Autumn of 1902. George Poole. By 1880 the rate book shows that George Poole was the publican at the Wheatsheaf, which was owned by John Williams. The Petty Sessional records show that the Wheatsheaf was only licensed to sell beer, cider and perry at this time. George was born in Thornbury. He may have been George Jones Poole baptised on 16th September 1827, the son of Thomas Poole a labourer and his wife Hannah of Milbery Heath. In the 1841 Census the family were living at Milbury Heath. George Poole and his wife, Ann (nee Cullimore) married at St James Church, Bristol on 23rd December 1854. They were living at Broadmead at the time of their marriage, but had moved to Thornbury by the time of the baptism of their daughter Minnie in 1866. Frank Cullimore Poole was baptised on 5th November 1871 as was his sister Selena. George was recorded as a basket maker at the baptism of his children. In the census of 1871 George and his wife were living in the High Street in a house which was demolished to make way for the new Methodist Chapel. George was aged 41 and a basket maker. The 1876 rate book shows he was at the same house as tenant of E. B. Lonnen and in the 1879 Gas Rate Book he was a tenant there of Mark C Meredith. We do not know if this George Poole is the same man who on January 23rd 1880 was reported in the Bristol Mercury as “of Milbury Heath” and as having been drunk and disorderly in the public street of Thornbury. He was sentenced to one month’s hard labour. In 1881 the census shows that George was aged 54 and his wife Ann was 49 and that they lived at The Wheatsheaf. Their daughters Minnie and Selena were still scholars at 15 years and 12 years respectively. Their son Frank also at school was aged nine. They had two lodgers in the household. Henry Longman aged 21 a labourer and a shoe maker from Liverpool called John Mureny. In 1881 on 22nd July William Hollester of Thornbury was charged at the Petty Sessional Court with being drunk and disorderly and refusing to leave when requested by the landlord who was George Poole. The Petty Sessional Court records show that George was a licensee at the Wheatsheaf until 1884 when he was convicted of “permitting premises to be the habitual resort of reputed prostitutes and allowing them to remain thereon longer than necessary for obtaining reasonable refreshment” on 19th July 1884. The penalty for this was £1 fine and 8/- costs. We have found another record that indicates the circumstances of how George Poole ceased to be a publican at the Wheatsheaf Inn. In 1884 the Bristol Mercury of 26th September reported that Alfred Stinchcombe applied for a beer licence for the Wheatsheaf as an interim licence. He had been refused at an earlier session. The Wheatsheaf Inn was said to have been licensed for 53 years and with one solitary exception that of the late tenant George Poole no complaint had ever been made against the conduct of the house. When the misconduct of the tenant (George Poole) was brought to the notice of the landlord in July last the landlord (presumably John Williams) immediately took steps to get rid of him and paid him £11 to give up the premises. The 1891 census shows that George aged 63 was now restricting his efforts to basket-making and it confirms that he and the family were now living next door to Wheatsheaf (the house that is now used by Thornbury Museum at 4 Chapel Street). Ann his wife was aged 58 and from Olveston. Their daughter Minnie was an assistant teacher and her brother Frank had started working as a printer’s assistant. They were renting the property from the Governors of the Grammar School. In 1892 and 1894 George Poole was given coats by the Mayor’s Christmas Charity. The rate books show George continuing to live in 4 Chapel Street up to at least 1899. Ann Poole was buried on 25th October 1900 aged 68. Her address at the time of her death was said to be the High Street. In the 1901 census George was a pauper who lived in the Thornbury Union, the workhouse. He was a widower and a retired basket maker. He died in the Union Hospital on 3rd July 1901 aged 75. Minnie Poole married George Wells on September 7th 1892. The 1901 Census shows Minnie’s husband George was a mason aged 42 and lived in Alveston. They had a daughter Doris May who was eight months old. Alfred Stinchcombe. The publican’s licence for the Wheatsheaf Inn in Thornbury was transferred to Alfred Stinchcombe on 24th September 1884. The rate books of 1885, 1887 and 1890 show that the inn was owned by John Williams and that Alfred Stinchcombe was the tenant. Alfred’s time in the Wheatsheaf was not very successful as the Bristol Mercury reported that in 1892 Alfred became bankrupt. His debts amounted to about £149. In court Alfred explained that he had commenced the business at the Wheatsheaf with £40 in capital and he had relied mainly on his wife to run the pub. Alfred blamed ‘bad trade’ and other problems following the sickness of a daughter and himself and the death of his wife in 1889 when she was aged 49. As a result he had to leave the Wheafsheaf and became a coachman. Isaac John Phillips. On March 27th 1891 it was reported in the Bristol Mercury that the licence for the Wheatsheaf was transferred to Isaac John Phillips. In the 1891 census John and Sarah Phillips were living at the ‘Wheatsheaf’ in Chapel Street. John was described as innkeeper and painter. They had a son, Stanley, aged five. This census records shows John as being born in Crossways, but other censuses clearly show him born in either Stinchcombe or Dursley. William Powell. There was a temporary transfer of the licence to William Powell on 5th July 1893. In 1894 Kelly’s Directory confirms that William Powell was a beer retailer in Chapel Street. This may have been William Powell junior a builder and milk man who lived at 40 Castle Street. Thomas Dinwiddy. In 1894 the Special Drainage Rate Book says that the property was tenanted by “Dinwiddy.” We believe this was actually Thomas Dinwiddy. In February 1896 Thomas Dinwiddy, a beerhouse keeper in Chapel Street Thornbury, was charged with “keeping open his house for the sale of intoxicating liquor during prohibited hours that is at 16 minutes past 11 o’clock.” The case was dismissed as it was not proved that the customers were actually sold alcohol after 11pm and were said to be “finishing up drinks.” However it seems that Thomas Dinwiddy left the Wheatsheaf about this time. Thomas was born about 1868 in Somerset. He married Sarah Anne Bryant in Barton Regis in 1894. The 1911 Census shows that Thomas Dinwiddy was 43 years old and from Highbridge in Somerset. He had been married for 17 years to Annie who was from Selworthy near Minehead. Their four children were Leonard aged 16, Stanley aged 15, Richard aged 10 and Edward aged 8. Leonard Arthur Dinwiddy was a gardener and had been born in Thornbury in the December quarter of 1894. Thomas died in 1926 in Williton in Somerset. Daniel John Howes (or Howse). The 1896 voters list shows that the publican of the Wheatsheaf was Daniel John Howes. The 1899 special drainage and 1900 poor rate book confirms that the Stroud Brewery Company owned this property and it was tenanted by Daniel John Howes. In the 1881 census shows Daniel Howes or Howse was the son of Mark Howse a general labourer and his wife Jane and that he was born just outside Thornbury at Sundays Hill. The family lived at Crossways. Daniel was 14 years old in this Census and his sister Emily was 9. By 1891 the census shows that Daniel who was then aged 24 had become a market gardener. He was still living with his parents Mark and Jane. Daniel married Sarah Ann Miles in Thornbury in 1894. Interestingly it seems that Daniel and his father both became publicans about this time – Daniel at the Wheatsheaf and his father Mark at the Black Horse. They are shown at these addresses in the Voter’s Lists of 1896. Mark died in 1899 aged 60 and was buried in Thornbury Cemetery on 2nd December 1899. He was still running the Black Horse at the time of his death. The Council Upper School records show that Daniel and Sarah Ann’s daughter Millicent Emily Howes was born on 22nd September 1895. Florence Sarah Howes was born 14th November 1896. St Mary’s Church baptism records show on 17th April 1901 Reginald John Howes was baptised the son Daniel John and Sarah Ann Howes of Chapel Street. Daniel was described as a Publican. The 1901 census shows that Daniel then aged 34 was beerhouse keeper at The Wheatsheaf. His wife Sarah was aged 28. The children by this time were Millicent aged 5, Frances aged 4 and Reginald aged 2 months. The household had a servant called Anna Prewett aged 16. “Florrie” as she was known sadly died on March 20th 1909. The records of the Council School have a tragic note that eight boys from the school acted as coffin bearers at the funeral on 25th March. Millicent left the school in 1909 by certificate. This means that she had permission to leave school – usually this was to help in the family business. The 1911 census shows us that Daniel John Howes still lived at the Wheatsheaf with his family. By this time he was aged 44 and he had been married for 16 years to Sarah Ann Howes aged 37 and who was said to have been born in Oldbury. Their daughter Millicent Emily aged 15 was now a draper’s assistant and their son Reginald John aged 10 was still at school. The records of St Marys Church show the burial of Daniel’s mother Jane Howes of The Black Horse in Thornbury on 12th July 1912 aged 72. The electoral rolls from 1923 to 1931 show that Daniel Howes continued to be publican at The Wheatsheaf Inn. There is no sign of them in Thornbury in the 1935 electoral register. Daniel died in Newent, Gloucestershire aged 76 in 1943 aged 76. He was brought back to Thornbury for burial in Thornbury Cemetery on 3rd May 1943. On 31st December 1955 the Bristol Times reported that the funeral took place in Thornbury that Wednesday at Thornbury Cemetery of Mrs Sarah Anne Howes aged 82 who formerly lived at the Wheatsheaf Inn in Thornbury. Mrs Howes died at the Dilke Memorial Hospital in Cinderford but she had formerly been living at Berkeley. The funeral service was conducted by the Rev B Deary the Congregational minister. The chief mourners were Mr. and Mrs. Reg Howes her son and daughter in law, Mr H Elliott her son in law. Both Daniel and Sarah Ann were buried in Thornbury Cemetery. Unfortunately we are unable to read the inscription apart from their names. Albert Ford. The next publican Albert Ford seems to have taken over about 1932. Albert was the son of James and Esther Ford who had earlier lived at 2 Bath Road. The 1911 census shows that Albert was living with his family at the Porter Stores. His parents were the publicans of that beerhouse aged 52 and 51 years old respectively in this census. The oldest son Charles was assisting in the pub business. At this stage the younger sons had occupations outside the family business. Albert aged 24 was a tailor and his brother George aged 19 was apprenticed as a carpenter. Although Albert had commenced his career as a tailor, by World War I his father applied for an exemption from service for him on the grounds that his other sons had been enlisted and Albert was now essential to his business as a carrier and licensee of the Porter Stores. The war might thus have been one reason for Albert’s change of career. The exemption application was withdrawn and Albert was mobilised on 3rd January 1917 to the T. R. Battalion but transferred to the Machine Gun Corps on 4th April 1917. His record shows he was aged 29 years and 6 months when called up and described as a tailor and carter 5ft 10 inches, chest 35 inches when expanded with 2 inch range and weighed between 124 and 133lbs. He was wounded in the hand caused accidentally by another man digging in the trench next to him. This was judged superficial but he had 33 days in hospital. He was finally demobbed on 21st February 1919. In 1920 Albert married Mabel Alice Nash in the Chipping Sodbury area. He went on to become a publican at the Wheatsheaf with Mabel. They had a daughter Reta Mary born in Axbridge area on 14th March 1925. Albert died aged 52 and he was buried in Thornbury Cemetery on 23rd May 1938. His widow Mabel Alice Ford became the licensee until the mid 1950s. The 1939 register compiled in preparation for the war shows Mabel was licensee and gives her date of birth as 12th August 1885. The register also lists Reta M Ford, and Mary E. Nash a school teacher born on 20th November 1889 who we assume to be Mabel’s sister. On the left we have a thumbnail image of a party at the Wheatsheaf Inn in the 1940s. Please click on it for a larger image. 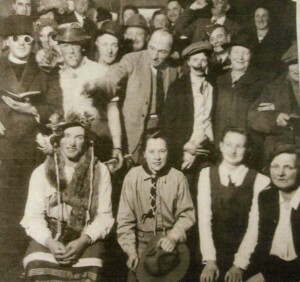 Mabel Ford is the lady on the left at the front and next to her is her daughter Rita M. The lady in the front row next to Rita and dressed as a scout is Kathleen Fryer who worked in the pub at that time. The newspaper article describes Mrs Ford as “legendary”. This remark and the happiness shown in the photograph shows how important the pub was to the community at a time of austerity. Mabel and her daughter Rita moved away to live in Horfield in the 1950s. Leslie and Winifred Powell. By 1958 the electoral registers show that Leslie and Winifred Powell had taken over the running of the Wheatsheaf Inn. In 1961 the registers show that they had a son Robert who appears to have taken over from them. Robert Powell and his wife Margaret ran the business from about 1963 to 1991. Mrs W. M. Powell was listed there in the 1967 programme for the Thornbury Flower Show. Honey and Russell Camp since 1999.